Chard is a tall leafy green vegetable commonly referred to as Swiss chard and scientifically known as Beta vulgaris. Chard belongs to the same family as beets and spinach and shares a similar taste profile with a flavor that is bitter, pungent, and slightly salty. Swiss chard is truly one of the vegetable valedictorians with its exceptionally impressive list of health-promoting nutrients. Although Swiss chard is available throughout the year, its peak season runs from June through August when it is at its best and in the greatest abundance at your local supermarket. Swiss chard—along with kale, mustard greens and collard greens—is one of several leafy green vegetables often referred to as “greens”. It is a tall leafy green vegetable with a thick, crunchy stalk that comes in white, red or yellow with wide fan-like green leaves. Choose chard that is held in a chilled display as this will help to ensure that it has a crunchier texture and sweeter taste. Look for leaves that are vivid green in color and that do not display any browning or yellowing. The leaves should not be wilted nor should they have tiny holes. The stalks should look crisp and be unblemished. Do not wash Swiss chard before storing as the exposure to water encourages spoilage. Place chard in a plastic storage bag and wrap the bag tightly around the chard, squeezing out as much of the air from the bag as possible. Place in refrigerator where it will keep fresh for up to 5 days. If you have large batches of chard, you can blanch the leaves and then freeze them. Rinse Swiss chard under cold running water. 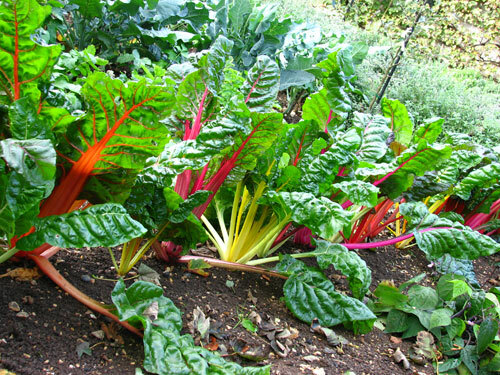 Do not soak chard as this will result in the loss of water-soluble nutrients to the water. Remove any area of the leaves that may be brown, slimy, or have holes. Stack the leaves and slice into 1-inch slices until you reach the stems. Only the white stems of the Fordhook variety of chard are tender enough to eat. Cut stems into 1/2-inch slices discarding the bottom 1 inch portion. We don't recommend cooking the stems of the varieties with colored stems. Swiss chard is only one of three vegetables we recommend boiling to free up acids and allowing them to leach into the boiling water; this brings out a sweeter taste from the chard. Discard the boiling water after cooking; do not drink it or use it for stock because of its acid content. Use a large pot (3 quart) with lots of water and bring to a rapid boil. Add chard to the boiling water. If stems are more than 1-inch wide, cook them for 2 minutes before adding the leaves. If less than 1 inch in width you can boil the leaves and stems together for 3 minutes. Begin timing as soon as you place the chard in the pot if you are using 1 pound or less of chard. If you are cooking large quantities of chard bring the water back to a boil before beginning timing the 3 minutes. Do not cover the pot when cooking chard. Leaving the pot uncovered helps to release more of the acids with the rising steam. Dressing, and top with your favorite optional ingredients. For details see 3-Minute Swiss Chard. Add zest to omelets and frittatas by adding some boiled Swiss chard. Swiss chard is an excellent source of vitamin K, vitamin A, vitamin C, magnesium, copper, manganese, potassium, vitamin E, and iron. It is a very good source of dietary fiber, choline, vitamin B2, calcium, vitamin B6, phosphorus, and protein. Additionally, Swiss chard is a good source of pantothenic acid, zinc, vitamin B1, vitamin B3, folate, and selenium.